Mastering the Concrete Way... Expressway, Taxiway, Runway and More! RGG United Contractors, Inc., first started business as a small residential contractor specializing in curb and gutter and sidewalk on residential projects in Arizona. Two friends, Martin Rangel and Roger Garcia, each brought their preference for GOMACO equipment into their new company. They added barrier work to their resume, too. In 2008, they brought John Kliethermes, a licensed structural engineer, into their company, and for the last 10 years RGG United has transitioned from residential projects into large federal and municipal projects, including slipform paving, taxiways, runways, and freeways. As RGG United has grown, so has the size of their slipform paving equipment. GOMACO has always been the preferred brand with RGG United first owning used GT-3600s for their curb and gutter work. 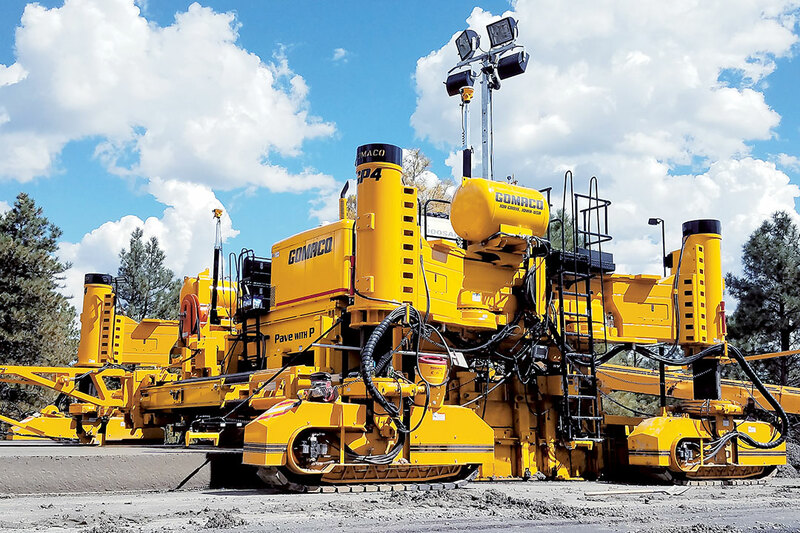 From there, they purchased a GOMACO four-track Commander III before graduating into the big pavers, a GOMACO GP-4000 with the capability to slipform projects up to 50 feet (15.2 m) wide in a single pass. A 9500 placer and T/C-600 texture/cure machine were also added. We started there with one paver, one cure machine, and a 9500,” Kliethermes said. 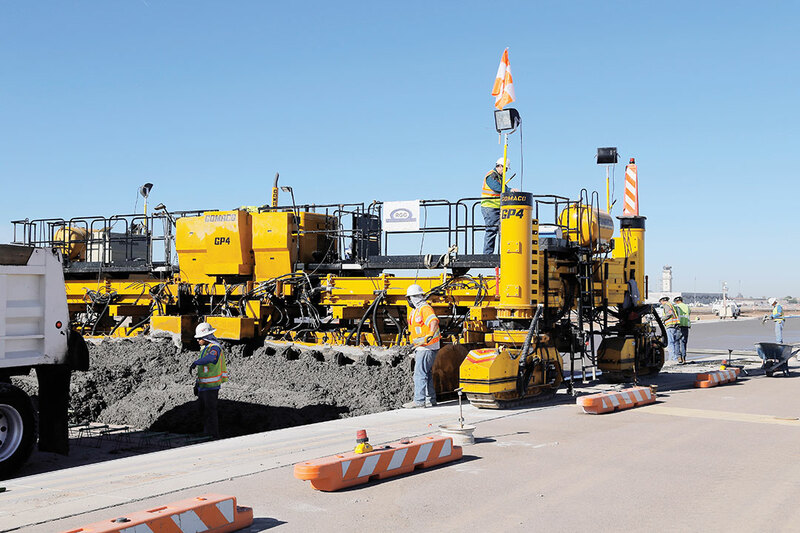 “It’s been a good stretch for us and now we’re almost solely revenue-based involved in airport and freeway work, probably 60/40 airport to not, and we’re the sole paving contractor for Phoenix Sky Harbor International Airport since 2009. As we grow, we need to have our equipment grow. Our two owners, Martin and Roger, have always taken a lot of pride in the equipment, keeping it updated, and keeping up with technology. If we have a successful year, their first inclination is to upgrade our tools. From my standpoint, it’s always fun to have new toys. 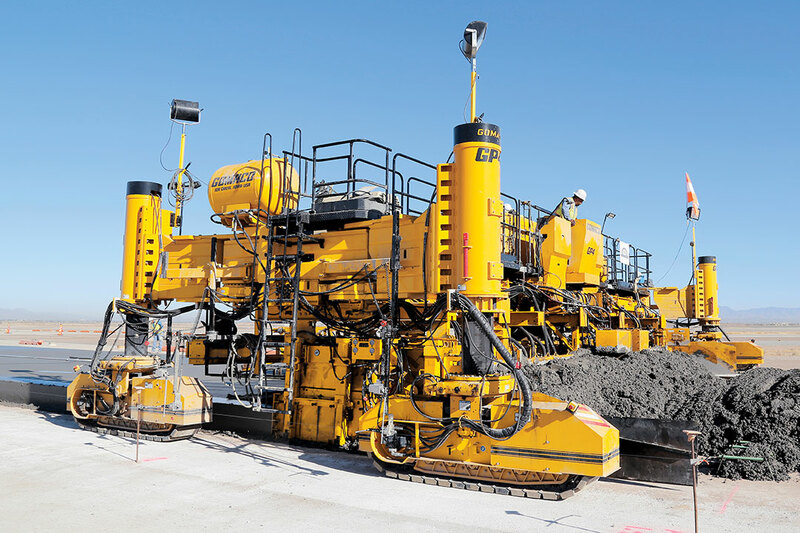 Last year, one of the pieces of equipment RGG United looked to upgrade was their GP-4000 slipform paver. Since the company is always looking for the newest technology, they were intrigued by GOMACO’s GP4 slipform paver. The GP4 is the second paver in GOMACO’s new family of slipform concrete pavers featuring the next generation technology. It’s the next step up in size from the GP3 and features the same revolutionary technology, but has the ability to pave up to 40 feet (12.2 m) wide. The GP4 paver is equipped with Smart Pivot Arms for leg positioning with rotary-sensored slew drives, as well as Smart Track Steering technology. The Smart Pivots on the legs provide the G+ control system with information on the angle of rotation and work together with the track rotation sensors to maintain the tracks in the straight-ahead steering line. Slew drives are also located on each of the paver’s four tracks for the ultimate in Smart Steering technology and extreme steering with the tracks having the ability to steer farther than ever before. The Extreme Steering capabilities also work together with the paver’s G+® control system, so the G+ system knows each track’s location and position. It has a dual-telescoping roller frame with Smart Cylinders and Smart Telescoping for accurate frame widening and automatic width reference for easy and accurate steering setup. 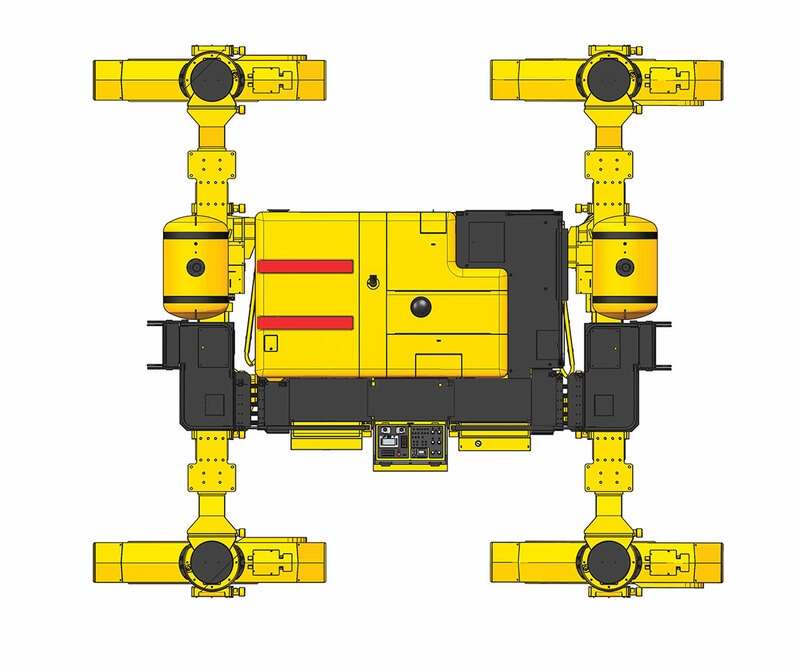 The modular roller frame telescopes up to seven feet (2.1 m) on each side for a total of 14 feet (4.3 m) of telescoping ability. Another big financial advantage of the GP4, attachments and sensors from their GP-4000 can be used on the new paver. With the G+ control system, it’s simply plug and play technology on the GP4. After all of the advantages of the GP4 paver were presented, RGG United knew they wanted one in their fleet. The order was placed and their GP4 was one of the featured pavers in GOMACO’s booth at CONEXPO-CON/AGG 2017 in Las Vegas, Nevada. From CONEXPO, the GP4 was shipped to its new home in Glendale, Arizona. The new GP4 is capable of paving widths up to 40 feet (12.2 m) wide and is the ideal paver for airport work when exacting smoothness and edge slump requirements must be met using difficult concrete mix designs. RGG United was able to utilize their existing attachments and sensors from their GOMACO GP-4000 paver on their new GP4 with G+ control system. The first major project for the GP4 was on the I-40 Devil Dog project in northern Arizona. Work included removing and replacing five miles (8 km) of the eastbound lanes between mileposts 156 and 161. The Arizona Department of Transportation decided to fast track the project due to a large number of fatalities along the strategic corridor. RGG United was hired by the prime contractor to do the concrete slipform paving. "I know when people think GP4, they think wider width paving, but it shrunk down nicely to what we needed,” Kliethermes said. “We did a lane path, 24 feet (7.3 m) wide and it performed nicely. This stretch had grades up to 12 percent incline and decline so it was a unique project climbing up and going down. The GP4 handled it well going uphill and pushing the concrete. The Arizona Department of Transportation uses the profile index (prI) with a 0.1 inch (2.5 mm) blanking band to measure smoothness on their roadways. Incentive bonuses are offered for smooth pavement. The Department of Transportation does offer payment up to $1 per square yard (0.8 m2) for that smoothness spec and we achieved the full $1 on everything we paved with the GP4,” Kliethermes added. “The first major project for this machine and we achieved full bonus, approximately a $70,000 smoothness bonus. That’s real money in hands for us." 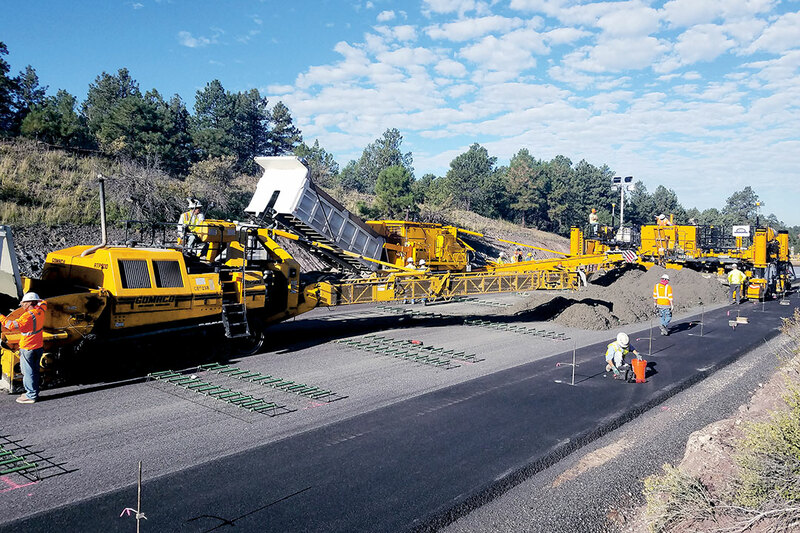 A GOMACO RTP-500 and 9500 concrete placer work in front of the GP4 paving 22 feet (6.7 m) wide on the I-40 Devil Dog project replacing five miles (8 km) of the interstate’s eastbound lanes. Freeway success. 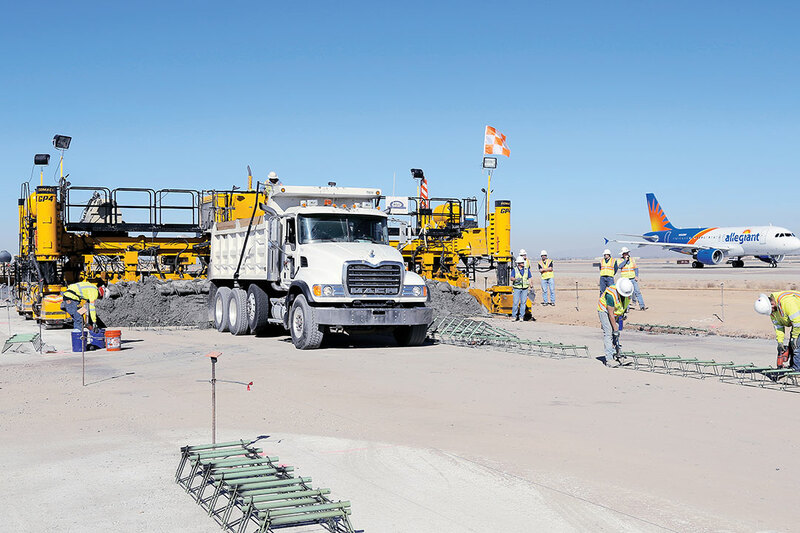 Next up, airport paving and a new concrete taxiway for the Phoenix-Mesa Gateway Airport in Mesa, Arizona, a 190 mile (306 km) transport for the GP4. The GP4 was engineered to be easy to transport. The operator simply puts the paver into Transport Mode by driving the legs around to the transport position with the GP4’s full-steer tracks and slew drives on the pivot arms. 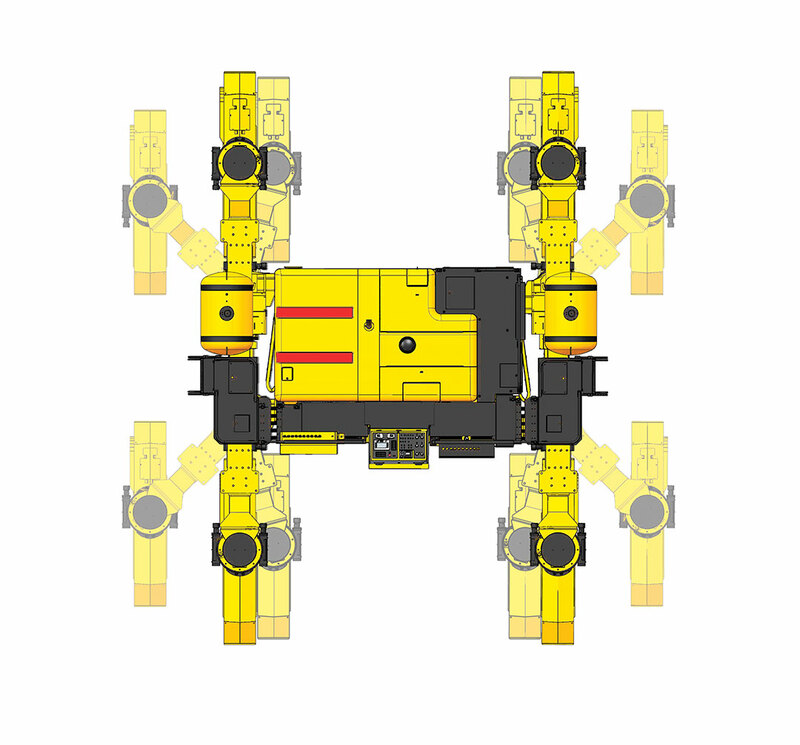 G+ travel is switched to “Transport” for complete control once the legs are in transport position. 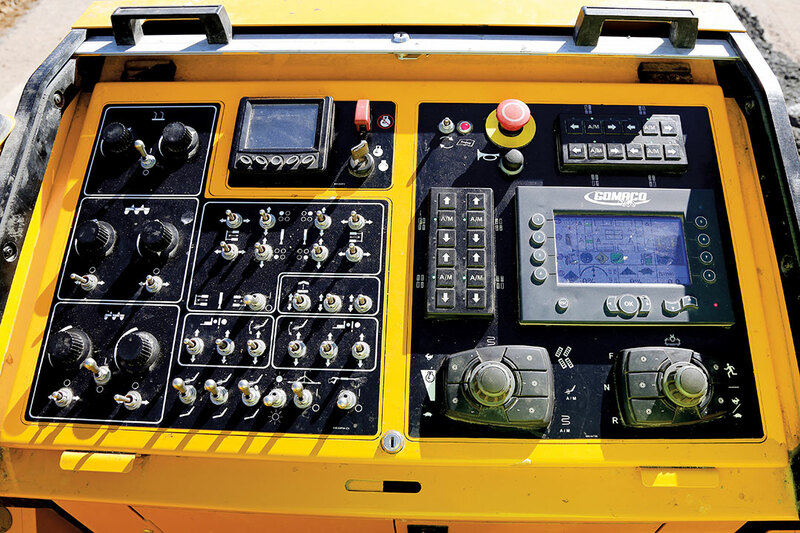 The GP4 also has a retractable, sliding operator’s console to reduce the shipping width of the machine. The slew drives and the telescoping frame make the paver so easy to transport and we’re able to transport it internally rather than having to hire it out,” Kliethermes said. Phoenix-Mesa Gateway is a commercial airport that is also heavily used for shipping and military needs. The airport’s 12,000 foot (3658 m) long runway is able to accommodate some of the world’s largest aircraft including the Antonov A380. Another incentive for the airport to expand is the Apache Strike helicopter manufacturing plant is located nearby making Phoenix-Mesa Gateway the preferred airport for shipping. This would be RGG United’s sixth project at the airport and included replacing the existing taxiway with a new 3500 foot (1067 m) long, 75 feet (22.9 m) wide curbside-rated aircraft taxiway. The GP4 completed the taxiway in two passes, each 37.5 feet (11.4 m) wide and 16.5 inches (419 mm) thick. Airports always need as much real estate as they can get for their operations and they don’t give us a lot of room to work in,” Kliethermes said. “Plus, they lock us into paving in just one direction. A nice thing about the GP4 with slew drives is we just extend the frame out far enough so the tracks can be turned 90 degrees and we can walk completely sideways. Then, we just have to back the paver up to the starting point for the next day’s pour. Its ability to move laterally forward, its travel speed and the simplicity of doing it were key purchasing factors for the GP4 and working inside an airport. The operator can put the GP4 in transport mode to walk the paver sideways or load for transport in minutes without assistance. It also features a fast job-site tracking speed for moving across the project. The GP4 has an impressive travel speed of up to 66 feet per minute (20.1 m/m). 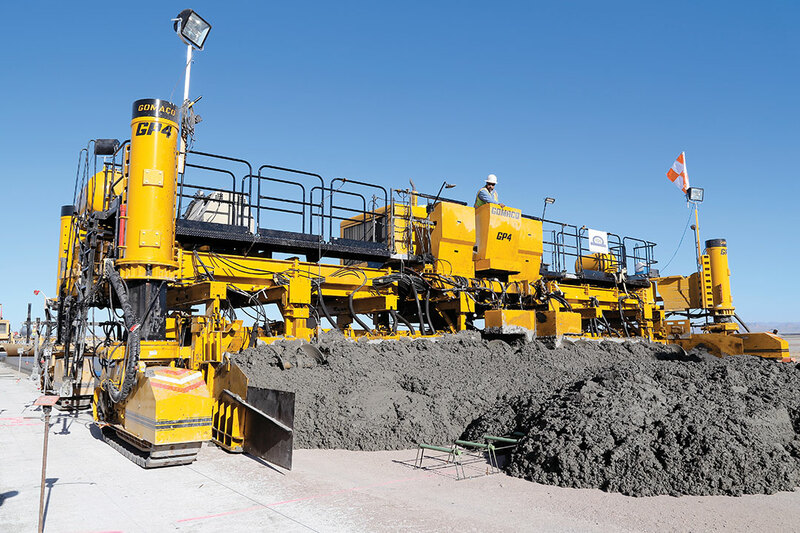 RGG United had their own concrete batch plant close to the airport to supply the concrete for the airport project. The concrete mix is their own in-house design built for the flexural strength required on today’s airfields. Airfield mixes are evaluated on their flexural strength rather than a typical compressive strength in concrete,” Kliethermes explained. “It’s a very high aggregate content, very rocky mix with a low slump preferred placement of less than two inches (51 mm). It is not finish friendly but the GP4 finished it out very nicely. Paving the airport’s new taxiway was completed in six days without any edge slump deficiencies and zero smoothness grinds. RGG United earned full payment for their paving on the project, as well as a six percent pavement bonus from the Federal Aviation Administration (FAA). 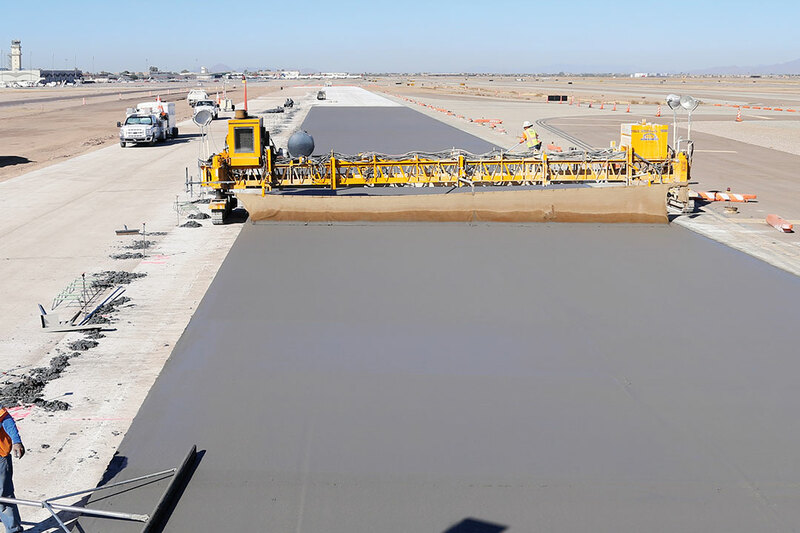 Wider-width airport paving is just one of the applications the GP4 was designed to pave. At the Phoenix-Mesa Gateway Airport, the GP4 was slipforming 37.5 feet (11.4 m) wide and 16.5 inches (419 mm) thick. The control tower for the Phoenix-Mesa Gateway Airport can be seen behind the GP4 paver as it slipforms the new 3500 foot (1067 m) long, 75 feet (22.9 m) wide curbside-rated aircraft taxiway. Federal Aviation Administration (FAA) and Army Corp of Engineer guidelines for airport paving requires finishing work to be kept to a minimum. They don’t even allow a bull float to be used on the newly paved concrete. Paver setup and performance is crucial for a smooth slab and sharp edges. Airport projects are not contractor friendly and with good reason because you have multi-million dollar aircraft landing and taxiing there,” Kliethermes said. “They want the best of the best and we give that to them every time, but we have to have the tools to be able to do that. GOMACO really did their research and put together a quality piece of equipment. When the GP4 paves, it holds the line better than any other piece of equipment. A GOMACO T/C-600 texture/cure machine followed the GP4 paver and applied the final texture finish to the surface of the new runway. According to Kliethermes, the airport classifies must-grinds and smoothness ratings. The FAA uses a profile index allowing a certain amount of variation per mile. RGG United had zero smoothness grinds earning full payment, plus a six percent pavement bonus. Paving on the airport was completed in six days and the new taxiway was open to aircraft in just three weeks. Since then, the GP4 continues to travel around Arizona successfully completing quality projects. From the Phoenix-Mesa Gateway Airport, it went to Sky Harbor International Airport in Phoenix for a couple of pours. Then the GP4 was transported to Holloman Air Force Base in New Mexico to slipform a 75 foot (22.9 m) wide taxiway. Everyone that has used the GP4 has enjoyed everything from the interface all the way down to how easy it is to access the hoses and service the piece of equipment,” Kliethermes said. “The paver handles beautifully and the ride comes out good. GOMACO has made a paver that is easy to move weight wise and versatility wise while also still providing the power and the strength to pave that thick of concrete, that wide. Sensored steer feedback with sensored leg pivots provide continuous reference for the straight-ahead track positioning. Full-steer tracks are turned perpendicular to the straight-ahead line. The G+ control system recognizes the track positioning and provides automatic steering control in the transverse mode. One unique project that RGG United is also currently involved with is a Federal Highway Administration mega project on the Loop 202 (South Mountain Freeway). According to the project’s website, it’s the largest project in the state’s history to design, build, and maintain (DBM) the freeway for 30 years. The DBM approach requires the developer to be responsible for maintaining the freeway and giving the traveling public a safe roadway for 30 years. RGG United will be slipforming approximately 76 miles (122 km) of barrier wall on the project. They’ll also be returning to their own curb and gutter company roots with the project’s 57 miles (92 km) of slipform curb and gutter. They currently use a GOMACO 4400 for their barrier work and will be adding another new 4400, as well as the new Xtreme three-track Commander IIIx for their curb and gutter work. 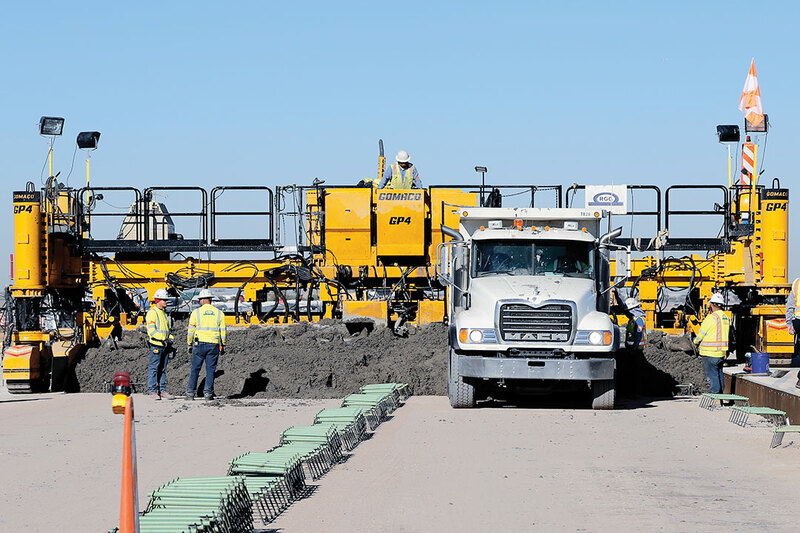 For the majority of work we do now, airfield paving and slipform barrier, there probably isn’t a specification tighter than when it comes to these two items,” Kliethermes said. “We have found that with GOMACO and their ability to stay on track with upgrading technology, it has allowed us to be able to put these in with less risk to us. GOMACO’s technology is just unmatched and they’re doing some innovative things with these pieces of equipment. GOMACO Remote Diagnostics (GRD) is just one of the innovations on their GP4. GRD is more than telematics, it gives RGG United the ability to see how, when, and where their equipment is being used. It’s a powerful extension to GOMACO’s existing service capabilities. It allows technicians a diagnostic review of a GOMACO machine from corporate headquarters in Ida Grove, Iowa, at the RGG United’s shop, or on the job site. GRD will transmit G+ settings, configuration and fault history for an immediate and complete diagnosis. GRD also allows software updates, fleet management, service indicators and so much more. GOMACO personnel can use GRD to send software updates directly to the GP4’s G+ control system. 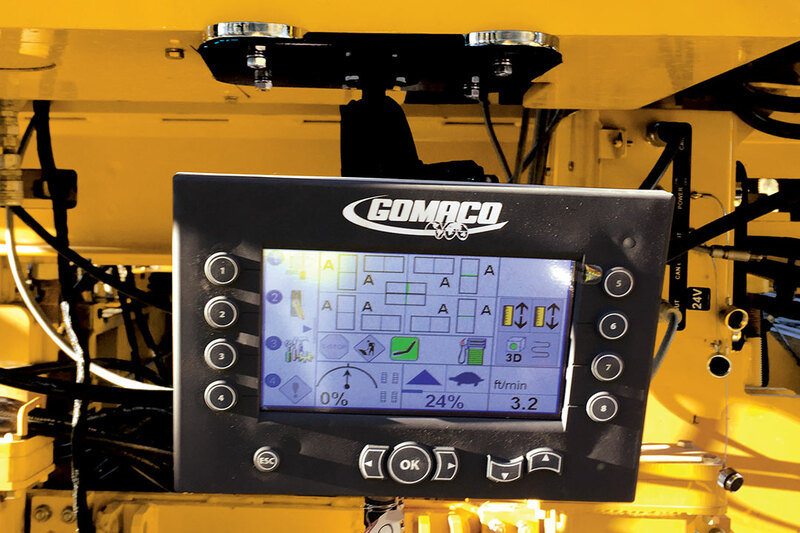 This remote capability from GOMACO headquarters also allows software updates to the G+ for specific applications or unique job-site logistics, such as new radius technology, support for new sensors, new code for 3D machine guidance technology, or additional updates for new product introductions. GRD can be used for fleet management and to keep track of GOMACO paving equipment throughout the season. Alerts for service indicators can be created to help develop a machine maintenance schedule, because machines that are properly maintained and serviced are less likely to develop mechanical problems. Alerts can be set for oil changes, filter changes, low fluids, or for a specific detail parameter of the machine, such as RPM is above idle. GOMACO pavers can be equipped with the GSI® (GOMACO Smoothness Indicator) to measure the smoothness of the newly paved concrete slab, on-the-go, right behind the paver. The current status of the paver’s smoothness performance can be accessed on a mobile phone or computer using GRD. GOMACO personnel in Ida Grove can also monitor the real-time analysis of ride quality on the project as it is happening. GOMACO’s partnership with RGG United has been beneficial for both companies. RGG United isn’t afraid of taking on challenges, from slipforming barrier wall eight feet (2.4 m) tall to meeting exacting specifications on concrete airport projects. Every day they master the concrete way and choose to pave with pride. The GP4 was equipped with G+ Ground Control, a remote operator’s screen. Ground Control lets the ground crew see the same screen that the operator does at the operator’s station. It also allows them to fine tune and make adjustments to the GP4’s settings. It can be mounted anywhere on the paver for easy viewing access.